We sell a good mix of roses, including climbers, ramblers, patios, shrubs, floribundas and hybrid teas, the majority grown in 5.5 litre size pots and all priced just £8.99 - £9.99 each. Reserve your Roses online now. For pruning tips click here. Hybrid teas usually grow to around 3-4ft height with small numbers of large blooms over a long period. Floribundas are a similar size bush but have, as the name suggests, an abundance of flowers, growing in clusters. Patio roses are dwarf varieties and are the ones to go for if you wish to grow roses in a container. 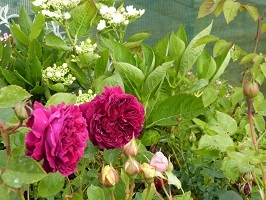 At the other end of the scale, shrub roses - including old-fashioned varieties - can get big! Climbing roses will usually grow to at least 8ft, and could get considerably higher, depending on variety. They usually flower for a long part of the season, if deadheaded, and flower best if the main stems are trained to an almost horizontal position. Rambling roses can have a wilder habit and will usual throw out all their blooms at once for a gloriously impressive show! If you have a light sandy soil it is a good idea to dig in plenty of organic material beforehand, such as well rotted manure or garden compost. 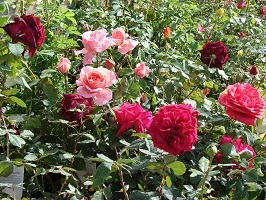 In East Anglia’s alkaline soil it can be beneficial to use a fertiliser containing sequestered iron after giving your roses their early spring prune. On all types of roses, diseased, dying and damaged shoots should be cut out, as well as any cross growth that may cause branches to rub against one another. 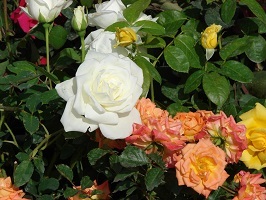 With patio roses and floribundas, shoots should be cut back by about a third; on hybrid teas by about half, while shrub roses need minimal pruning. Climbers and ramblers should be left to develop a framework for the first few years. Ramblers flower on old stems, so can be pruned after flowering, if desired; with climbers, the sideshoots can be cut back in early spring, because they flower on young growth. For more pruning advice visit ourFacebook page to watch a short video! 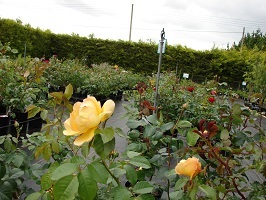 As our roses are container-grown or containerised they can be planted at any time of year. Bareroot hedging plants can be ordered in autumn - please email for more details. If there is a variety you particularly want, please phone or email to check beforehand.